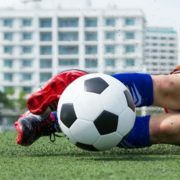 Recently, European authorities (the European Chemicals Agency, ECHA, and the Dutch National Institute for Public Health and the Environment, RIVM) evaluated potential risks from using synthetic turfs, filled with rubber crumb from recycled tyres, for sports activities. Both authorities concluded that these sports fields can be safely used. Nevertheless, public debate about health concerns is still ongoing. This research project is initiated by the European Tyre and Rubber Manufacturer‘s Association (ETRMA) together with the Crumb Rubber Industry Platform (CRIP) and is carried out by the independent scientific consultancies FoBiG, Eurofins and Labosport. With this research project a major effort is made to fill remaining data gaps and to come to a comprehensive risk assessment of substance potentially available from rubber crumb used as infill material in artificial turfs. During the project rubber crumb samples from tyre recycling companies as well as from artificial turf fields are obtained and analysed for chemical substances. In addition, volatile substances released from the rubber matrix to air and substances released into body fluid simulants are measured. Finally, exposure measurements are performed in the air over artificial sports fields and other potential intake routes (oral or dermal) are assessed. The information is compiled and a detailed exposure assessment is performed for groups of people using the sports fields. By comparing the exposure information with the hazard profiles of the substances a risk characterisation is performed in order to investigate if there are risks from exposure during use of these artificial turfs. The methodology and the results of this project will be published. This project, with a planned duration of 2 years, started in early 2017.